My earliest memories of fashion and style weren’t glossy magazines. Yep, they were big in my teens + college years and I once got severely reprimanded for owning a Cosmopolitan. But that’s a story for another day. My earliest memories of fashion were made up of South-Indian heroines. Nope, not the fancy Vyjayantimala and Hema Malini variety that glossies love to gloss about. I’m talking about a girl from Andhra who watched the quintessential South films with stars like Bhanupriya, Suhasini, Radha or Vijaya Shanti, even Gautami. If you don’t know who these guys are, look ’em up. Vijay Shanti in Challenge: Sorry could not find better pictures! Always with long braided hair, wearing glossy red lipstick and a big bindi paired with these gorgeous hoop earrings and transparent saris and teacher high-neck blouses. They were real beauties and they are the fashionistas who ruled my life in school. Fashion was contrived at that time, I’ll admit. It came with a funny rulebook too (woman with good morals = high-neck blouse/ woman with bad morals = sleeveless blouse and such!). Especially Vijay Shanti, in this movie called “Challenge”, she would wear such great hair jewelry, it was so amazing and so creative as I look back now, she even drapes her saris so differently in every song. You can see an example song here, ( Ignore the standard Telugu dancing) really – they were super creative those days with outfits. Even Suhasini plays this school madam in this movie Aaradhana, pretty cool stuff in starched saris and fully-covered up blouses carrying an umbrella near the beach. Anyways, I realized how much this new label reminded me of that era so I had to feature it. Brand Latha has really taken over Instagram last few months – it was even featured in Vogue Russia and Japan and the styling is so so on point. The dark eyes, the light-pastel hues and the sweetest fabrics, it’s just so retro and so wearable. 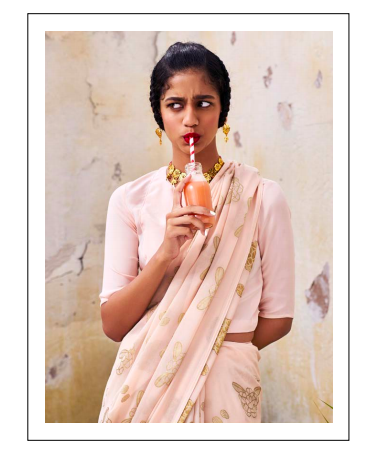 The model reeks of South-Indian swag – she could be a younger Suhasini ( a Popular South Actress!). Forget the hair and makeup for a bit, the fabrics are like swishy South saris and the langa-voni (Long South-Indian silk skirt with a drape) combo came with a contemporary twist – it’s the langa-jacket now *Sigh, too happy to live in these times, I tell you! The simplicity is palpable. The fabrics are light as air. And the styling work done by Meghna Bhalla took me back to those sweaty Rajamundry summers where 16-year olds worked in their home gardens in silk langa-jackets and sipped coconut water while gossipping about the horn-rim spectacled boy next door. Meghna used the outfits to create a newer idea of a Southern girl – someone bolder and more poised. I especially love the frowny face vis-a-vis a glazed “I’m-totally-spacing-out-but-am-woke” look models sport these days. Well, am loving this and so will you – and I think my South-Indian fashion story will continue and this label will flourish and come out with newer silhouettes soon. I, cannot wait to see how this story unfolds. But for now, gloss over the pictures, will you? This label hails from the house of Latha Puttanna. P.S This post really reminded me of my love for South-Indian filmy fashion. And I’m gonna continue to write more about it. Movie pictures via Cinema Chaat. Previous Weekly Vibes: Life-changers This Week!